The upcoming Matador Motorsports team poses with the 2017 race car that finished 7th overall in the Formula Society of Automotive Engineering event in Lincoln, Neb. Photo by David Hawkins. 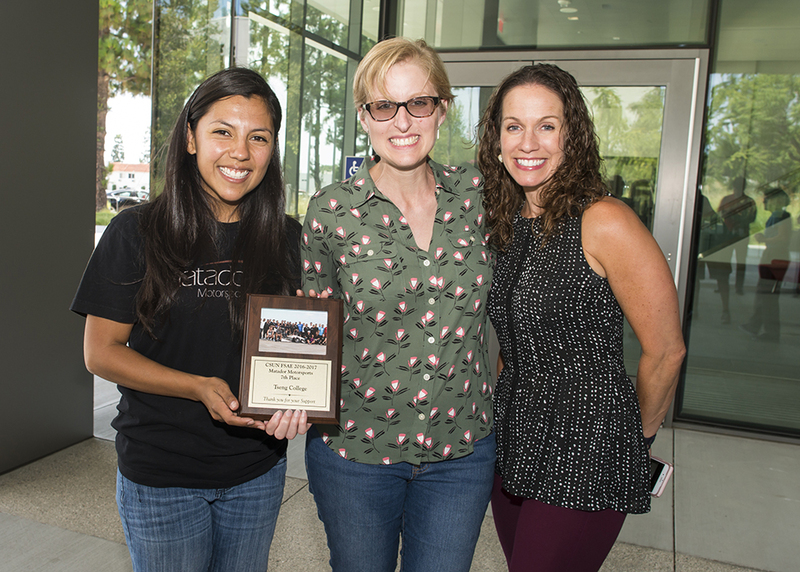 2017-18 Matador Motorsports project leader Alicia Eugenio (far left) gives a plaque to Tseng College staff. The college donated Smartsheet project management licenses to the team. Photo by David Hawkins. The Matador Motorsport, standing with the 2015 race car, answers questions from the Tseng College staff. Photo by David Hawkins. 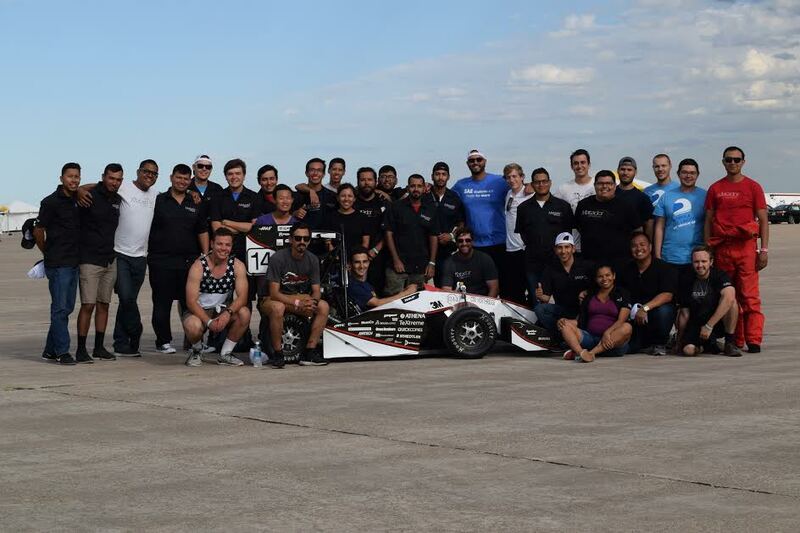 The 2016-17 Matador Motorsports team poses with the race car after the SAE competition in June. Photo provided by Alicia Eugenio. The team displays its trophies from the 2017 SAE competition. CSUN finished 7th overall, the best of any California school. Photo by David Hawkins. 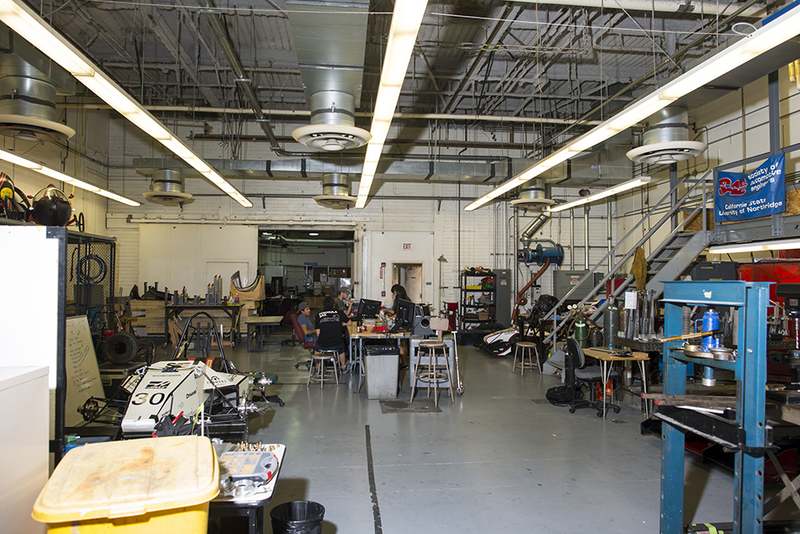 The Haas Lab, located inside Jacaranda Hall, is where mechanical engineering students design the Formula-style race car each year. Photo by David Hawkins. 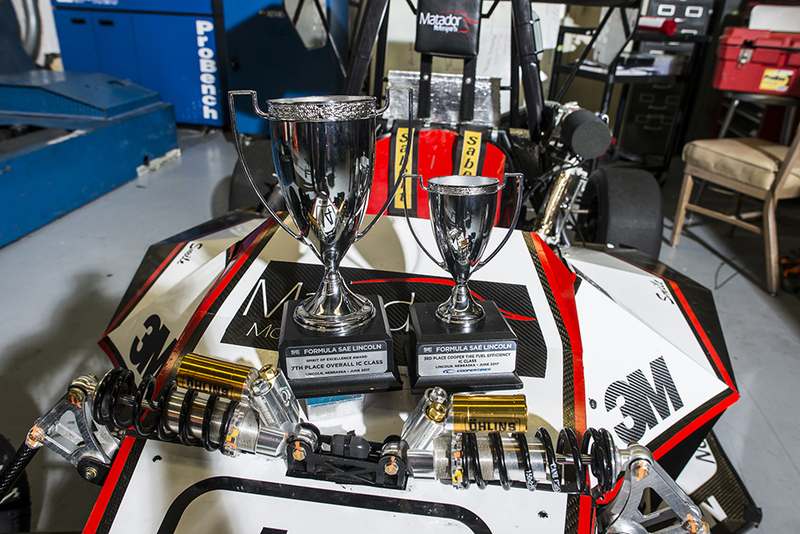 The culmination of months of hard work and long hours paid off for California State University, Northridge’s Matador Motorsports as the team finished seventh overall — ahead of UC Berkeley, USC and UCLA and the team’s best finish since 2007 — in June’s Formula Society of Automotive Engineering (SAE) event in Lincoln, Neb. 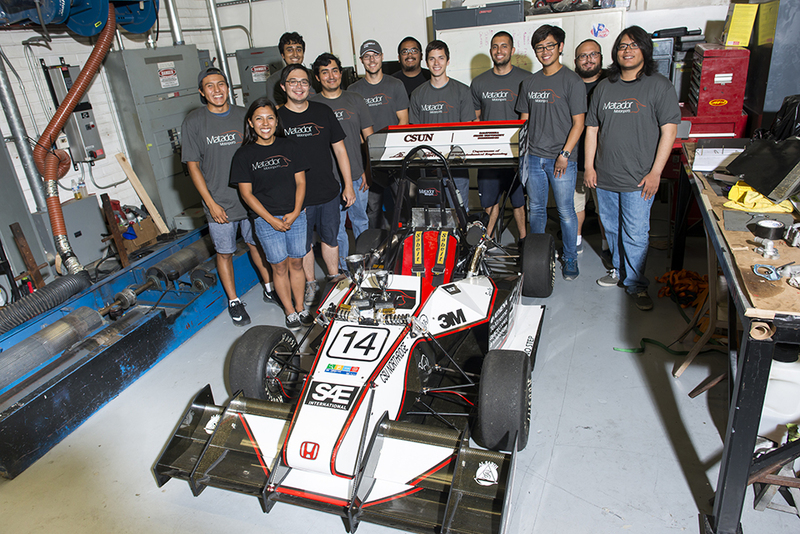 The Matador Motorsports team consists of CSUN mechanical engineering students who work together throughout the year to design a Formula-style race car as part of a two-semester senior design class. Students compete in a series of driving events, such as vehicle acceleration, maneuvering, endurance and non-driving events that include business pitches, a vehicle cost report and a design competition. This year’s competition, which featured a total of 110 schools from the United States, Japan, Mexico, Canada and Brazil, saw CSUN near the top of several categories. The Matadors finished in the top 10 in car design (seventh), presentation (fifth), car maneuvering (fifth), endurance (fifth) and fuel efficiency (third). The CSUN’s Tseng College contributed to the student team’s success by donating smartsheet online project management tool licenses. 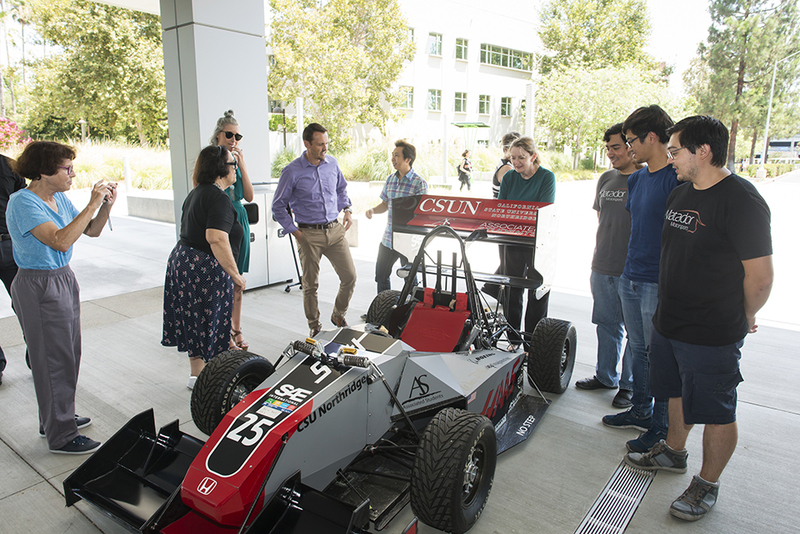 To show their gratitude, the Motorsports team brought its 2015 car, which finished 12th overall in the competition, to the Tseng College on July 25 and let staff take pictures inside the car and ask the team questions. Shortly after the event ended, the new crop of mechanical engineering students who will take part in next summer’s SAE competition were hard at work in Jacaranda Hall’s Haas Lab. Led by student Alicia Eugenio (who Prince said is the first female to be the team’s project manager), the 25-person team has worked throughout the summer on the initial stages of the upcoming race car. Following the great performance in June, Eugenio said the Matador Motorsports team hopes to up the ante in 2018. For more information, visit the Matador Motorsports website.